eCommerce is an open-access, competitive market, where winner takes all and loser gets nothing. This way or no way. So, how not to hit the bumps along the road? Fortunately, we’re aware of all eShopping trends and ready to reveal you a few secrets, as ever. Cannot match GoDaddy to BigCommerce? Challenging goal, but not impossible. Our eye-opening eCommerce platforms comparison will make everything right and help you make up your mind. Forget the hype, we’ll show you all their unvarnished pros and cons and select the champion. Welcome to the clash of titans! Intense competition between shopping platforms makes hard to compare such giant sales panels as GoDaddy and BigCommerce. Today it’s not enough for them to be just good. They must be top of the line to attract and keep new customers. Both carts are great fits for small and mid-size businesses. Actually, their similarity ends here. Simply put, GoDaddy is the largest solid web hosting service, well-known when it comes to domain registration and online marketing. It’s loaded with features and offers excellent value for money. GoDaddy provides a variety of services and aims to be a one-stop shop for all of your eCommerce needs. Is something better? Yes, if you know where to look. BigCommerce is hands down one of the most robust solutions to start and run your eStore on. If you plan on having truly beautiful, flexible, popular and profitable online shop, you’re in need of such all-in-one sales panel. It’s a platform of choice for famous brands like NFL’s Carolina Panthers, PayPal Here, Toyota, Ford UK, Ben & Jerry’s, Gibson Guitars, Paul Mitchell and Kodak. So, what attracts it to users? Let’s look behind the scenes. 86 % of time spent on smartphones is using apps. Thus it’s increasingly important to have an eCommerce website that is mobile friendly, as over 40 % of online shoppers using their mobiles or tablets to make purchases. GoDaddy’s cell phone friendliness is rather doubtful. It doesn’t give you full control over how your site looks on portable devices. In a nutshell, GoDaddy may screw up certain sections of the eStore and make them irrelevant to people on the move. Hopefully, you know how crucial the first look is to a potential customer. As for mobile responsiveness, on a scale of 0 to 10 BigCommerce gets 11. All its templates are perfectly designed and viewed on smartphones, tablets, and desktops. But it’s just icing on the cake. For those who like to keep on top of trends, BidCommerce themes run 'Accelerated Mobile Pages' (AMP), which can have some positive SEO implications as well. This format is good at reducing the number of mobile users who leave your eStore as a result of your content loading too slowly. By delivering clients enjoyable eShopping experience you'll get a higher percentage of engaged visitors and potentially sales. GoDaddy’s hosting plan costs float from 22.99 to 59.99 $ monthly. Not that much, right? Just keep in mind, guys, you’ll have to put on top extra 29 $ for a domain name. Price for its ‘Enhance’ plan starts at 34.99 $ and go all the way up to 44.99 $ for ‘Grow’. What’s the difference between these two plans? Well, quite a lot actually. You’ll be opened up to credit card payments, client management tools for contact info, appointments and payment histories. Special Commerce plan’s price is 839.99 $ per month. After buying your web hosting package, you can also use GoDaddy’s own beginner-friendly panel called GoCentral. BigCommerce offers four month-to-month pricing ranges from 29.95 (Standart) to 249.95 (Pro) $. The Enterprise Plan was designed for large business and corporates. Its price depends on your advanced functionality requirements. A 10% discount is available for the 'Plus' and 'Pro' plans if you purchase an annual package. We all fell for sales, face it. So, if you bet on greed and cheaper but limited store builder, BigCommerce isn’t something for you. But if you are looking for an industry leading, fast-growing and features-packed shopping platform to run your business, BigCommerce is definitely a candidate for you to consider. Have you ever bumped into a gap between how you envision something on the webpage and how it actually turns out? We’ve all been here. But keep calm, you’ll not be frustrated with these platforms design possibilities. Exactly the opposite, they’ll exceed your highest expectations. GoDaddy includes a massive library of 300+ free, flexible and modern themes sorted by industry. Seriously, there are multiple templates even for the most surprising categories. You can filter them by sections, for example, sport, food, photography, pets, travel, etc. This subdivision will dramatically simplify your selection process. 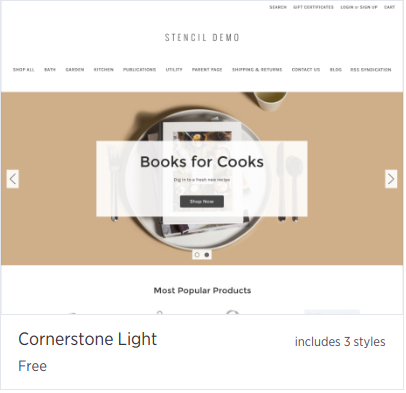 But with BigCommerce design tools you’ll make customers eyes really light up in your eStore. 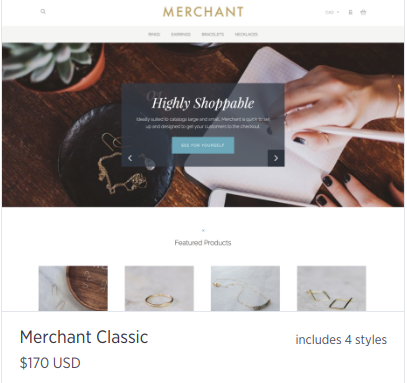 It offers you 7 free and 76 paid premium templates (priced from 145 to 235 $) to dress up an online store in the best way. Their multipurpose nature and stylish look satisfy even the most demanding guests. If you’d like to modify the storefront by yourself, BigCommerce allows the freedom to do so. What’s more important, ALL designs are optimized for mobile viewing. You do want to make your website attractive to customers on the move, don’t you? There’s no formula how to attract new customers, but only one golden rule. The more opportunities you give them, the better feedback you receive. We have nothing to say about GoDaddy’s app market ‘cause it doesn’t even exist. All features are built-in and come with their pros and cons. So, you don’t have to spend a ton of time digging around. On the other hand, some features lack depth such as blogging and may not be able to perform every task you want of them. BigCommerce has on offer 600+ add-ons, and while some apps come with extra expense, a good number of them are free. For example, make packaging a little easier, generate and print shipping labels with Shippo. Connect your site to Trustpilot and increase your brand visibility. Whatever you do, don’t underestimate additional features importance. They’ll help you bend to a customer instead of asking the customer to bend to you. 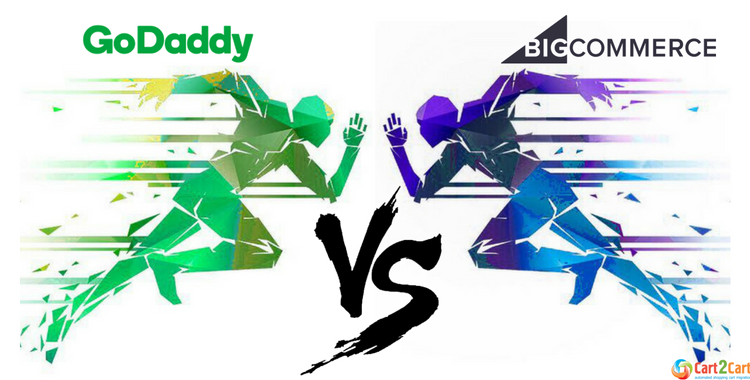 Summing up GoDaddy vs BigCommerce review, we can decide who comes out on top. GoDaddy is something you may like, but not fall in love with. It’s far from fulfilling many eCommerce needs or requirements and definitely has a room for improvement. But to become the best, you should always be looking at how to step your business up a level. GoDaddy’s hardly much use when it comes to perfection. BidCommerce has a superior product, analytics, marketing, customer interfaces built-in, with access to many excellent, valuable tools that automate and enhance your store. In addition, it’s pretty easy to use, and you can create an eStore and get it live in a matter of minutes. With this panel, you’re in safe hands day or night. Finally, if you’re not getting better, you get worse. Don’t be afraid, Cart2Cart won’t allow that. If you’re ready to perform BigCommerce migration, its official partner on our behalf will do everything for you in the best possible way. Still have doubts? Try Free Demo and get rid of them. Keep in touch with all eCommerce trends and good luck with your new BigCommerce store.